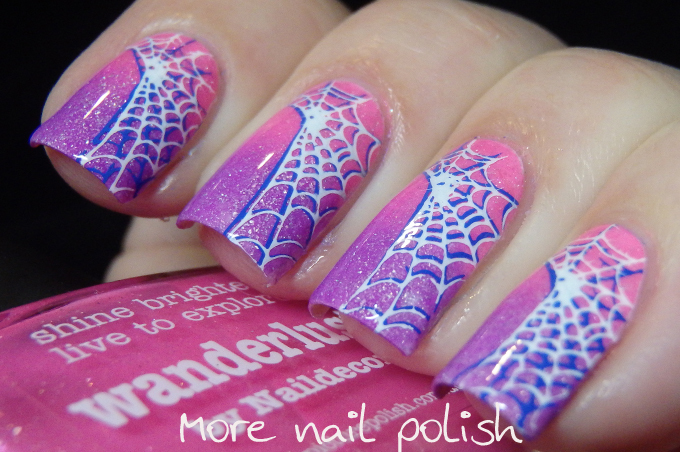 Yeah - you read that right, this is a Halloween nails post! This broken leg has really set me back as far as blogging goes and it's a real struggle to get to the PC to write up blog posts, both physically and mentally. But I'm here now, so I might try get a few written up and scheduled! I'm pushing myself to post this mani, because it's a full two weeks late, given that is was the prompt form the 26 Great Nail Art Ideas challenge of "Halloween in the wrong colours" that should have been posted two weeks ago. I actually didn't do any Halloween nails this year (with the exception of these). Halloween just isn't a big thing where I live. 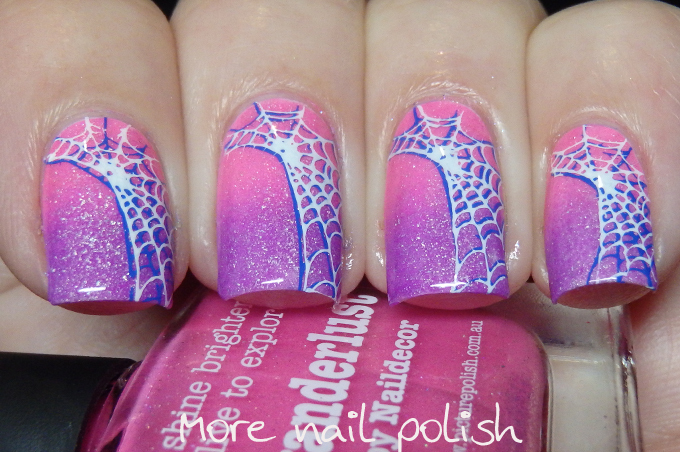 That said, I totally loved these nails. Probably because they didn't feel halloweeny at all! 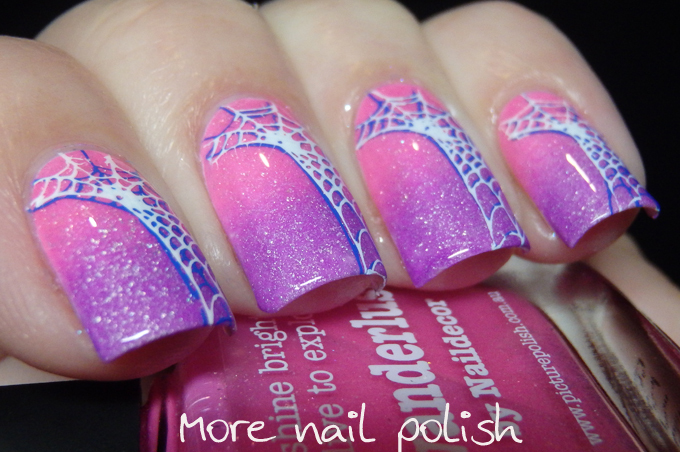 I created a gradient using Picture Polish wanderlust and orchid and then did double stamping with a spiderweb design using blue and white polishes from Mundo de Unas. So many beautiful designs!!! I love these "wrong colors" it sparks creativity! 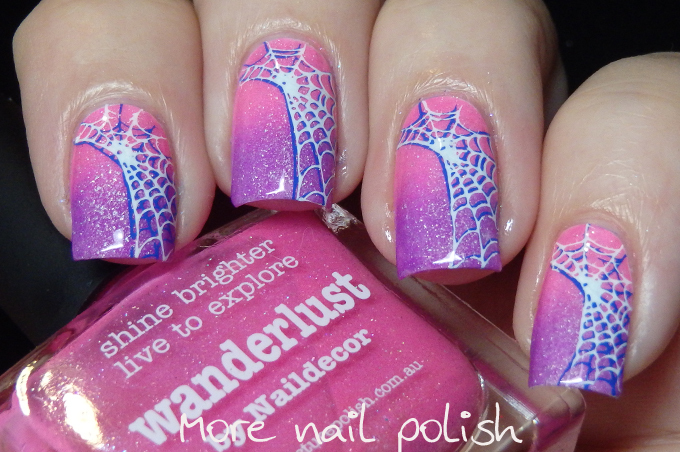 LOVE these nails -- especially since they're not in scary spider colors!!! :) Hope you heal up OK (and can take it easy too).